You can find Primoz on LinkedIn or Twitter. This is our recent interview with him, as part of our Kinsta Kingpin series. Hi ? thanks for having me! I’m Primoz Cigler from Slovenia. I first heard about WordPress in 2006 and quickly adopted it for my own blog and that’s when I’ve started poking around with the PHP and other web technologies. After graduating from astrophysics, I steered away from the academic career and (so far) started two WordPress businesses. I’ve co-founded ProteusThemes 5 years ago together with a designer Jaka. It’s a WordPress theme shop for agencies and freelancers who are building websites for local businesses. 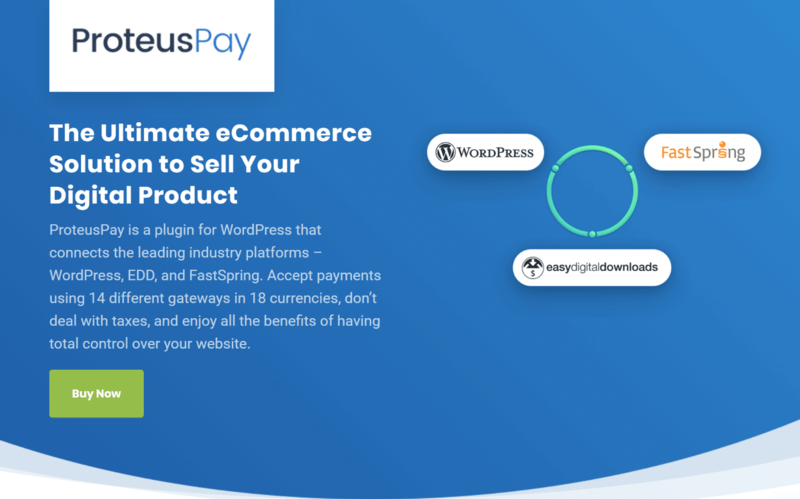 More recently, just 1 month ago, I’ve started ProteusPay – an ecommerce WP plugin which drastically simplifies selling digital products and subscriptions, especially for EU-based businesses. We’ve built it out of our own needs for ProteusThemes, but since many people reached out to me and asked about the solution we’ve refactored the code and released it as a standalone WordPress eCommerce plugin. Before that, I’ve been freelancing over the summers when I didn’t have school and tried a few other things to earn money online: from selling stock photos to blogging and earning affiliate commissions. One of the biggest challenges in 2017 was to shift ProteusThemes from being 100% dependent on revenue from the marketplaces to an individual theme shop. We underestimated the efforts of running the theme business and growing it in 2017 in the overly saturated market with some well-established players is very hard. However, by sticking to high-quality standards and paying attention to the customer’s pain points with the current solutions, we’ve managed to address the right problems and provide the solutions to the problems that WP theme buyers face today. From my experience, one of the biggest issues is big and bloated multipurpose themes which try to be the right fit for any kind of website. That comes at a cost of a huge codebase, lots of features nobody needs, they are hard to use, break often and are slow as hell. Our team is working hard to understand the key components that make a successful website for a local business. The majority of the added value in our themes doesn’t come with features, but with the layouts and designs that are serving the purpose of the business, the theme has been created for. That said, it’s easier for an agency to take over the prospect with a proposal of our theme and it takes them less time to implement and deliver the final website. Instead of bundling all kinds of useless features in the theme itself, we instead ensure the maximum compatibility with a wide variety of plugins. One of the challenges related to this was how to justify the same or even higher prices of our themes compared to the competitors which bundle whatnot in the theme itself. Over time I’ve realized that our best customers are the ones that have tried several multipurpose themes and realized that it’s not what they need. It sounds funny, but it’s easier for us to close the deal with the leads who have been working with the other themes before. They tend to stay longer with us and are in general happier with the approach we take and philosophy we follow. In general, I’m quite sad that there are so few software engineers in this space. That’s especially true in the plugins & themes business. Most of the products are made and maintained by people who know just enough they are capable of putting together a working solution, but not a reliable one. Too many times I’ve found myself in a situation where I was explaining the industry best practices to people who enjoy the most reputation in this community. The other positive extreme is how friendly and welcoming the community is in general to everyone. In comparison to the majority of WordPress business owners, I’m looking forward to seeing the fresh air Gutenberg and 5.0 release will bring to WordPress. I’m sure that the new technology stack will allow WordPress to keep the pace with the rest of the tools available today for creating a website. Hopefully, it will also encourage people who’ve been completely satisfied with their technical knowledge for the past 10 years to start learning new stuff. There’s lots of potential with the ProteusPay we’ve just launched. At the moment we’re selling the standalone plugin, but that has been only the intermediary step to the final point. I’d like it to transition to SaaS – hosted eCommerce platform – in the next 6 months. In the current form, it’s just a single piece of a larger puzzle, and as such it’s interesting only to the people who know how to do all the other stuff (install, setup and maintain WordPress, connect the themes and plugins to play together nicely etc.). By opening up a platform, you’re not selling any more to the people who are setting up the website for someone else, but to the people who are using your product directly as-is and gain the direct benefit. I’m a technical person and I like DevOps. First thing is for sure SSH access with WP-CLI pre-installed or at least an option to install it. Without this, I cannot work efficiently. The second thing is the support, which should be timely and be able to recognize bigger issues quickly and delegate to the right team. The third one is the speed of the stack. Let’s Encrypt integration is a big plus. I’m an addicted windsurfer. I’ve built the company and the team around the remote-first philosophy, which allows everyone in the team to work location-independently. I go traveling for 2-4 months a year, some other employees spend more time during the summer at a seaside and work from there. Definitely Greg Priday from SiteOrigin. We use their page builder plugin in all their themes successfully for years now. Their videos as a way of communication are outstanding as well. I have a high level of respect for Greg & the whole SiteOrigin team. Thank you and thanks for reading it! Primoz, I just wanted to let you know how much I respect your decision to focus on the design of your themes, instead of loading them up with unnecessary functionality (like way too many of the large, multi-purpose themes do). I agree this is a huge problem in the WordPress world. Your themes truly are beautiful. And I wish you the best with your new product, ProteusPay. Thanks for taking the time to share your thoughts. Thank you for stopping by and reading the interview! 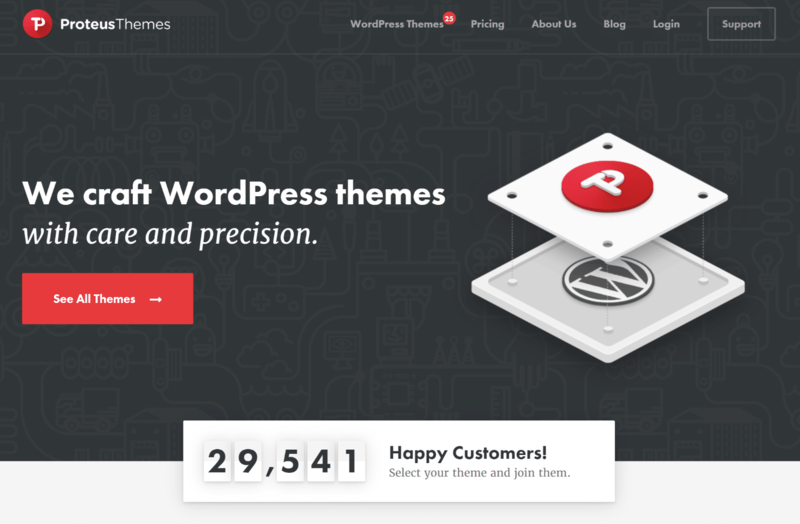 To be honest, it seems that majority of the customers these days want bloated multi-purpose themes because the sales are very concentrated on such themes. However, what you don’t want to do in such situation is coming up with the same product as it’s already on the market and hoping for the best. Part of our strategy also involves educating the theme buyers and showing them the alternative and why it’s better. There will never be a single theme (or any product or service in any space) that would truly be able to satisfy all the needs.